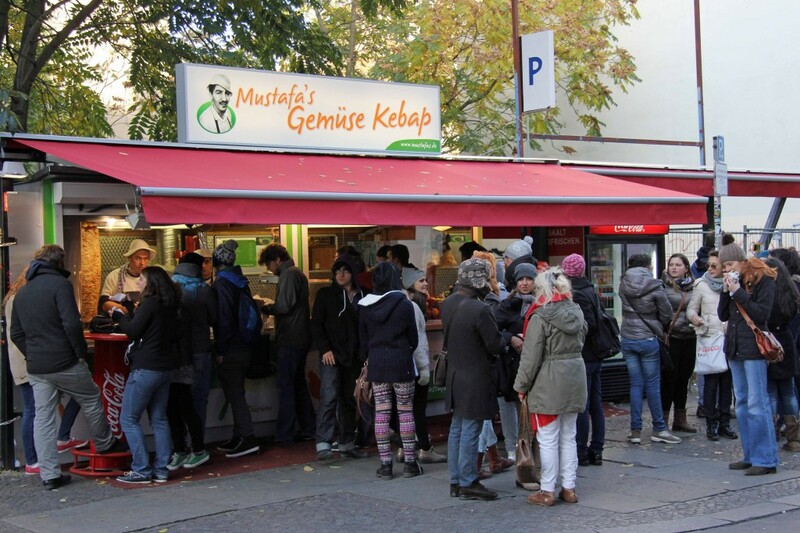 Believe it or not, despite living in Berlin for a year, I still haven’t been to the hugely popular Mustafa’s Gemuse Kebap on Mehringdamm, where the queues rival the Berlin Currywurst institution, Curry 36, just a few steps along the street. I did have a Döner at the newer and less well-known stall on Oranienburger Strasse near Hackescher Markt this week though. There was also a short-lived stall operating under the U-Bahn station at Eberwalder Strasse earlier in the summer, though opinion was divided on whether this was the genuine article. When I went to the Imbiss on Oranienburger Strasse the other day I was pleased to see that there was no queue and I ordered a Döner. 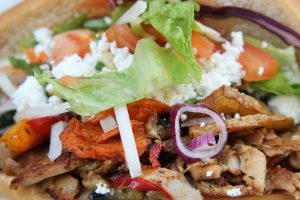 The combination of chicken with fried vegetables, fresh salad, Feta cheese, a squeeze of lemon and, for me, Scharf (spicy) sauce is a taste sensation. As I did when I visited Curry 61, I took my food to the nearby Monbijoupark to eat. 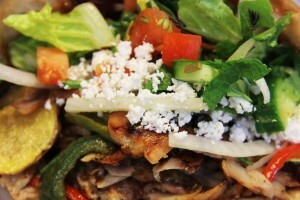 The funky Mustafa’s website is worth checking out for the Döner Disko (click on the speakers) alone. Don’t fall for the Live Cam (click on the CCTV camera) though – people are certainly not wearing shorts in Berlin today, when it’s 3°C. 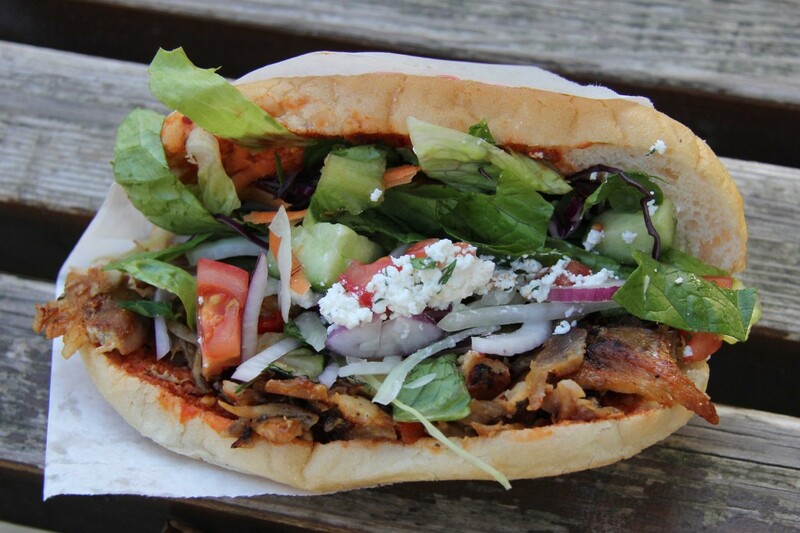 At €3, a Döner (with Chicken) at Mustafa’s Gemüse Kebap is excellent value for money and great for lunch or as a snack to soak up some booze on a long Berlin night out. I will have to brave the queues and visit the original soon. You pointed this out to me as we turned the corner to the Jewish cemetery; it was the first time I’d seen Mustafa’s at the corner. The other day I went to Curry 36 and as I walked north to U Mehringdamm, sure enough, just a few metres north of Curry 36 was Mustafa’s. I’ll have to keep this in mind when I’m hungry. I have heard nothing but good about this place. 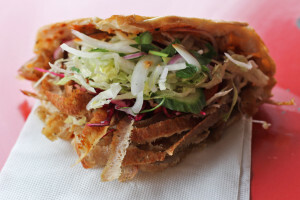 I suppose next time I am in the area and slightly drunk (since, you know, döner is totally drunk food) I will have to try out a vegan version.. maybe something with falafel. Classic Berlin eh? I’ll have to stop by and give it a try! Totally brings back memories of my two years in Berlin. Thanks for the mouth-watering reminder! I am afraid it’s gone now. So it was kind of short-lived, too. That is really too bad. I’m gutted. I went to get a Kebap there the other day and was shocked to see empty space. Thanks for reminding me to update my post. nooo 🙁 thanks for the update anyways!